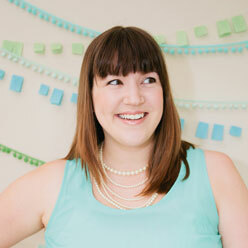 If you’re looking for a fun way to celebrate Valentine’s Day, I’ve got just the DIY for you! 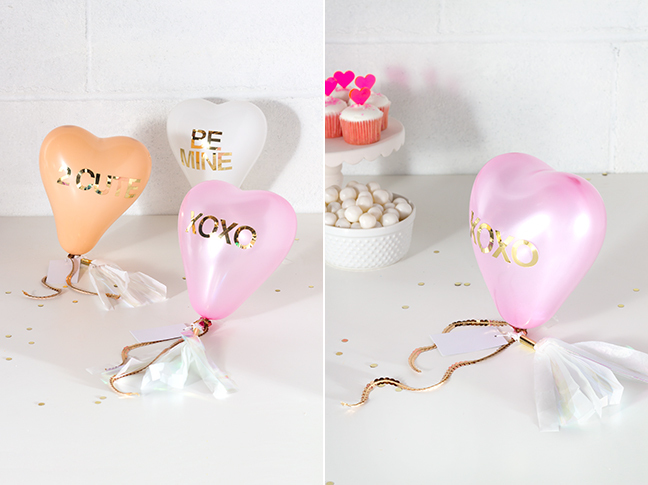 Inspired by everyone’s favourite chalky Valentine’s love heart lollies, these conversation heart balloons are a modern, sparkly interpretation of the classic conversation heart. Add a fun little tassel and an optional gift tag, and you’ve got a sweet little surprise that everyone will love. A helium tank is optional for these guys since they don’t hold enough air to even really let themselves take off, but I highly recommend filling them this way. 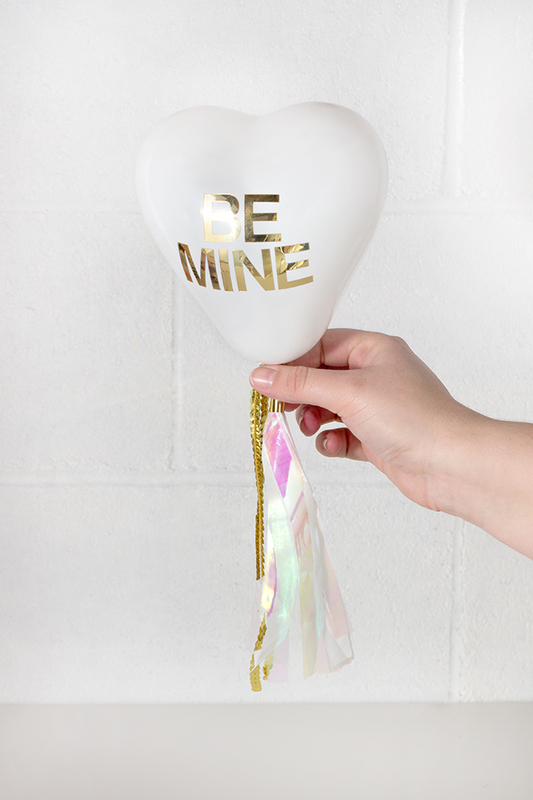 Although the hearts won’t float, they will stand upright as shown, which is so nice if you decide to leave some Valentine’s hearts at everyone’s desk at work (or school – the kids will love this one). It takes such a small amount of helium to inflate these guys that even if you had them blown up at the local party store, you won’t be set back very much at all. 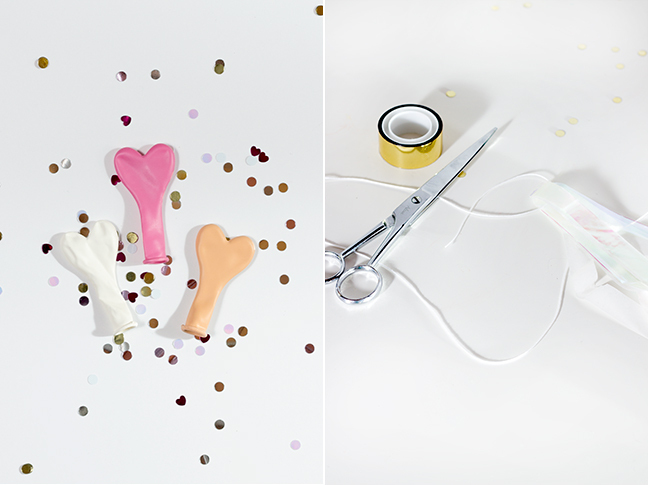 Step 1: Inflate the mini heart balloons with air or helium. Using the gold vinyl stickers, write out simple conversation heart phrases including: BE MINE, XOXO, UR CUTE, MY LOVE, KISS ME, CUTIE PIE, TRUE LOVE, and any other short phrases you’d like to add. To ensure your phrases are centered on the balloon, start applying letters at the center of the word, working outward. For example, if you are writing BE MINE, add the B slightly to the left of the centre and the E slightly to the right, so the space between falls at the centre of the balloon; then do the same for MINE. If your word seems a little too weighted on one side, never fear! The vinyl letters pull off without too much hassle, making fine tuning fairly easy. Step 2: Cut mylar and tissue paper into into 1 cm wide strips. They can be as long as you’d like, but double your desired length as they will be folded over. For example, I wanted a 15 cm tail to mirror the size of the balloon, so I cut them 30 cm long. Set them aside. Step 4: Twist the strips on themselves to gather the tassel until you have about 1-2 cm of twisted area. 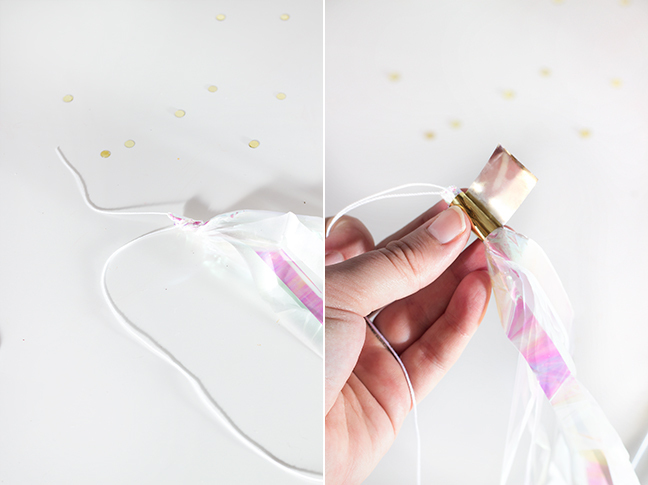 Cut a small bit of metallic tape and wrap it around the twisted section for a sparkly way to secure the tassel.